The Asantehene, Otumfuo Osei Tutu II, is Africa’s fifth richest king according to estimations by Forbes. The King of Asantes is estimated to be worth $10 million and his source of wealth, according to Forbes, is from mining equipment, property and jewelry. Otumfuo Osei Tutu II came behind King Mswati III, Swaziland; Oba Okunade Sijuwade, Ile-Ife, Nigeria; Oba Obateru Akinrutan, Ugbo Land, Nigeria; King Mohammed VI, Morocco in the ranking. King Mohammed VI, Morocco was named Africa’s richest king with an estimated net worth of $2 billion. He made his wealth from investments. Oba Obateru Akinrutan, Ugbo Land, Nigeria, came in second with an estimated net worth of $300 million from oil. Oba Okunade Sijuwade, Ile-Ife, Nigeria, and King Mswati III, Swaziland came in third and fourth respectively. Oba Okunade Sijuwade is estimated to be worth at least $75 million from construction, property, and oil while King Mswati III is worth at least $50 million from investments. 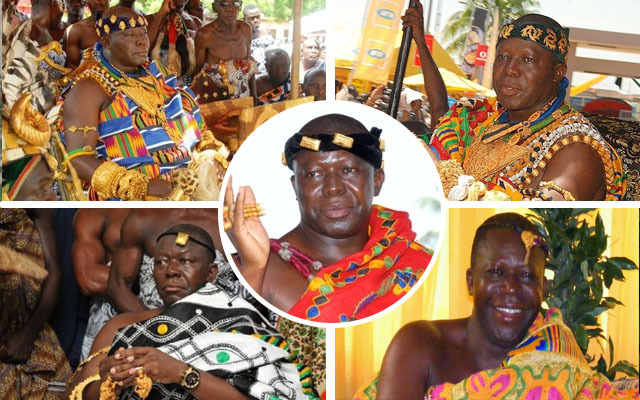 Otumfuo Osei Tutu II, who ascended the throne in 1999 and serves as the political and spiritual head of the Asante people, in 1989 set up Transpomech Ghana, a $12 million (sales) company that provides mining equipment to several large industrial companies in Ghana. According to Forbes, he also owns extensive real estate in Ghana and South Africa as well as a collection of valuable gold crown jewels. Africa’s richest king, His Majesty King Mohammed VI, derives his fortune from his control of Société Nationale d’Investissement (SNI), a large Moroccan investment holding company with assets valued at more than $10 billion. SNI’s largest asset is a 48% stake in Morocco’s largest bank, Attijariwafa, as well as controlling stakes in mass distribution giant Marjane Holding; mining company Managem Group and mobile telecoms company Inwi. The King, according to Forbes, also owns a substantial chunk of the world’s phosphate reserves. The 27th king of the Alaouite dynasty ascended the throne in July 1999 and immediately set out to initiate a series of socio-political and economic reforms that have made the Kingdom freer and more prosperous than during the reign of his father, King Hassan II. In 2014, he introduced a new family law giving women legal equality with men in key areas; his economic strategy has led to the creation of new industrial zones which in turn has given a boost to the number of global industrial corporations setting up shop in Morocco. On the political front, King Mohammed VI has enacted a series of reforms to the country’s constitution, including amendments that stripped him of some of his political powers.